Green Snap Frame Light Box . This lovely green light box has a snap frame that is Moss Green - RAL 6005 so looks great. 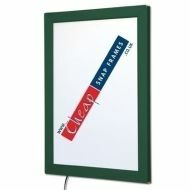 These moss green light boxes are ideal for internal signage that you want to attract attention to. The snap open and shut system of the frame makes it really easy and quick to change your images. The whole range uses high powered LED technology that gives you very bright illumination, cheap running costs and very minimal maintenance. Typically the LED's last for at least 10,000 hours. 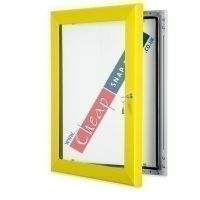 The power supply is low voltage so these green light boxes are easy and safe to install. Our green light boxes are available in a range of sizes from the small A5 to massive 40"x60" inche so there is sure to be a size to fit your situation.